My sister is very organized and loves things neat and tidy. With four kids, having a bike and scooter each, it is sometimes hard for their stuff to be ‘put away’. To help organize the helmets, she put command hooks and vinyl names on the wall. I thought that was a great idea. The scooters are difficult, because they aren’t self standing. If you have kids, I’m sure you understand the problem! For Christmas this year, I made her a bike and scooter rack out of wood, so the kids would have somewhere to put their bikes and scooters. This bike rack works great for big bikes and little bikes and razor scooters. 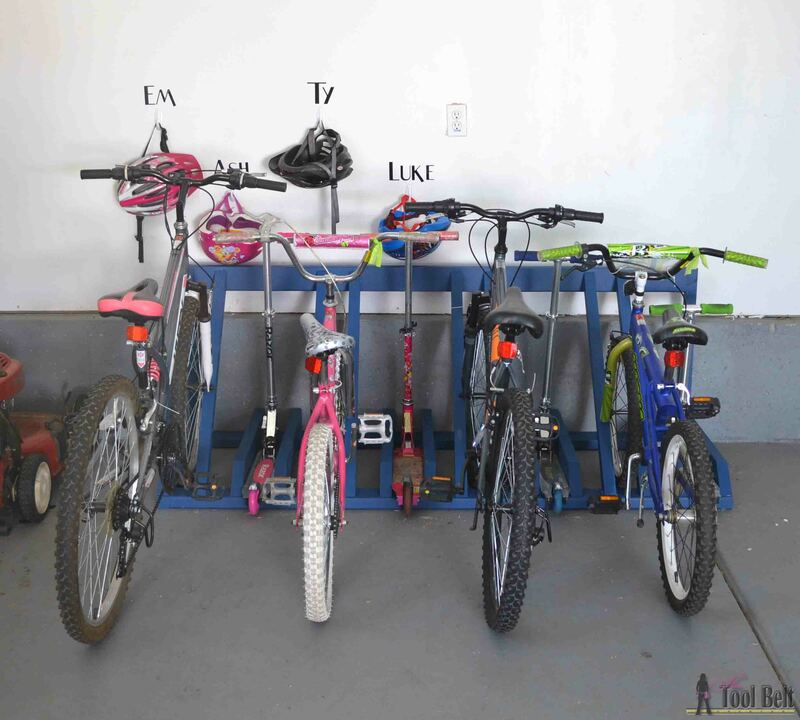 If you need a kids bike rack with integrated helmet storage, you should check out this great one by Addicted 2 DIY. 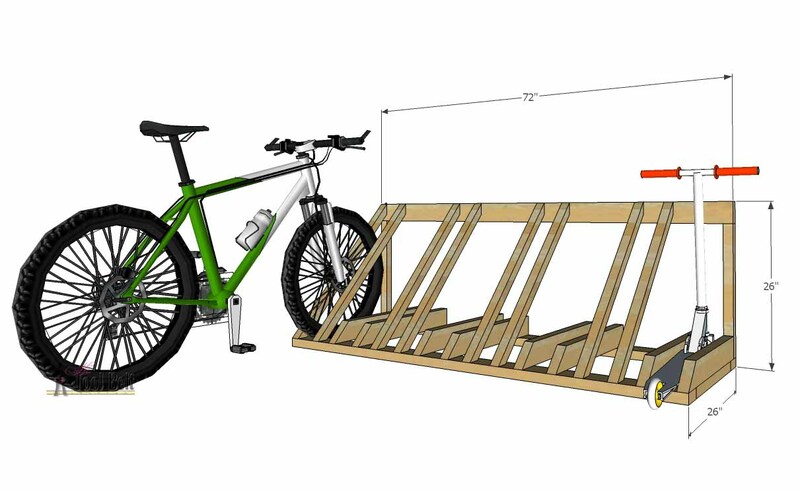 This bike rack is really easy to make, you just need a miter saw and drill. 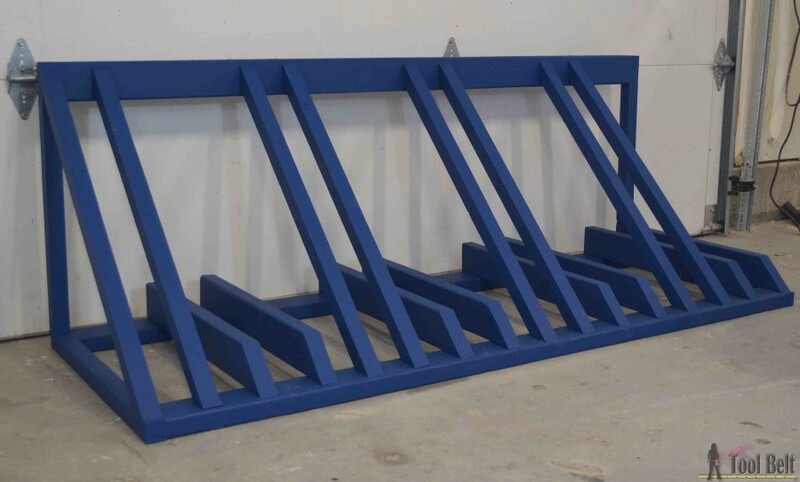 8 – 1 1/2″ x 1 1/2″ x 34″ with 45 deg cut on both ends facing each other. Pre-drill all of the holes before putting the screw in to prevent the wood splitting. 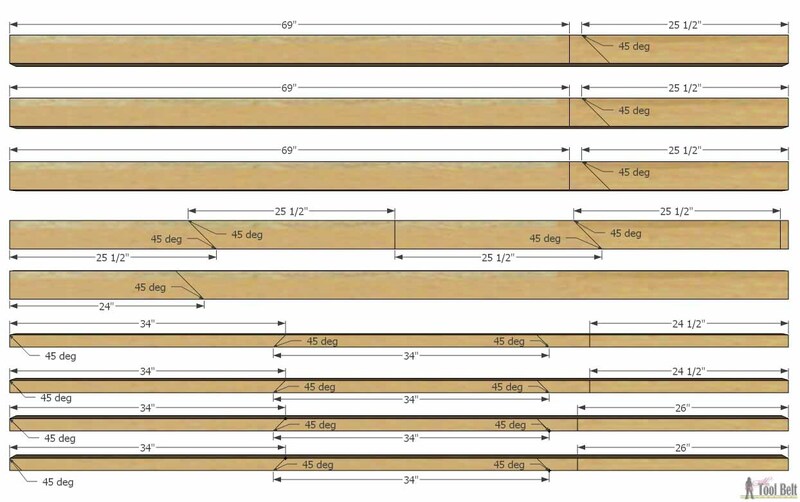 Cut all of the boards according to the cut list and diagram. 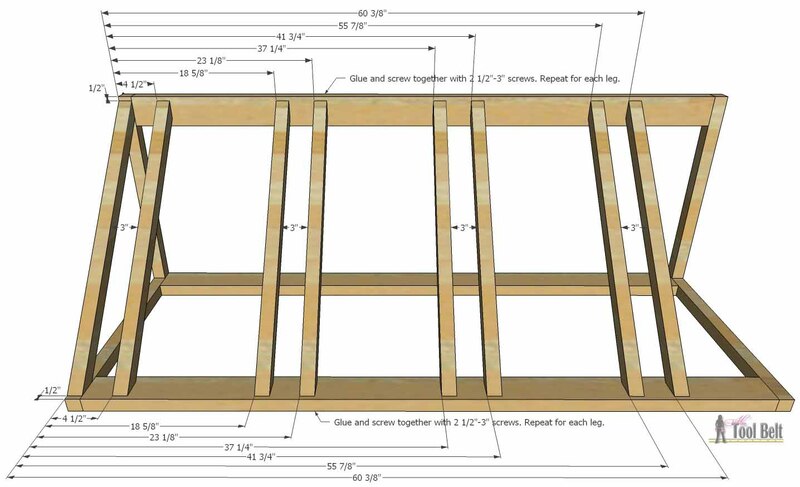 Attach a 26″ board to each end of two 69″ boards as shown, secure with wood glue and 2 1/2″ screws to create the base. 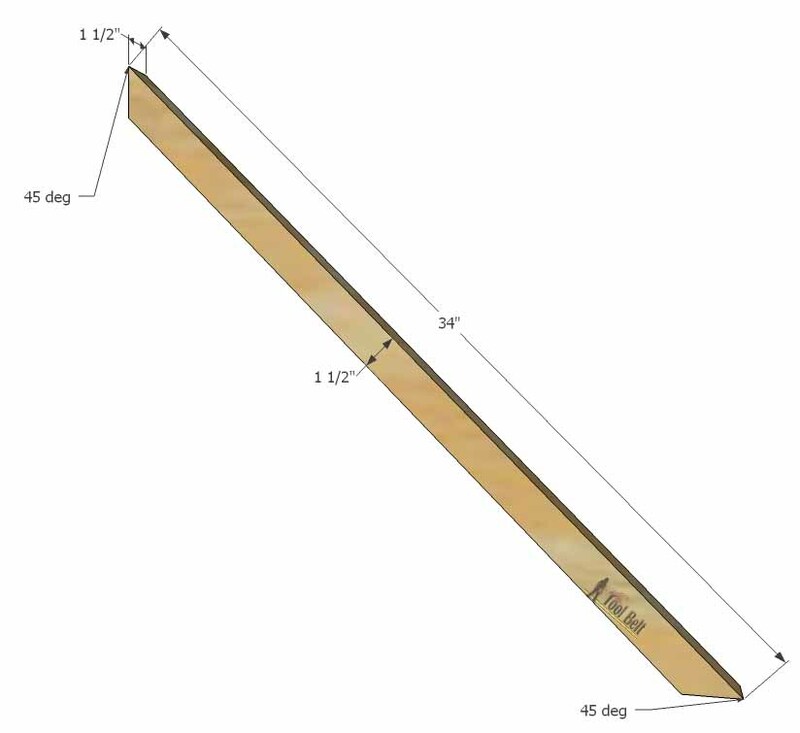 Attach a 24 1/2″ board to each end of the remaining 69″ board, secure with wood glue and 2 1/2″ screws to create the back. 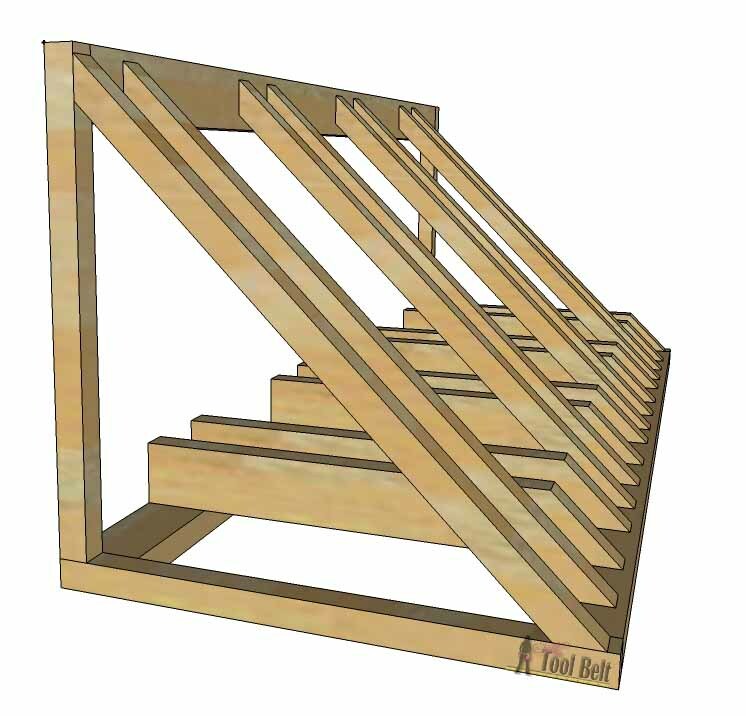 Attach the back to the base, secure with wood glue and 2 1/2″ screws. Keep the back flush with the back of the base. Determine the spacing you need for your bikes and/or scooters. 3″ seemed to work great for all of my Sister’s bikes (adult to child) and 4″ for the Razor scooters. You can adjust the following measurements accordingly. Measure and mark the location of the bike supports on the base and back. Pre-drill holes for the bike supports and secure with wood glue and 2 1/2″ screws. Measure and mark the location of the scooter supports on the base. Pre-drill holes for the scooter supports and secure with wood glue and 2 1/2″ screws. All of the bikes and scooters fit great! I think the best thing will be that the scooters will now stay in place, and there is room to get bikes/scooters out without tipping others over. 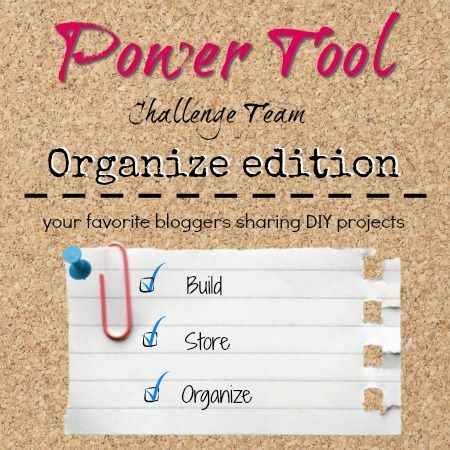 This bike rack is part of the organization power tool challenge. 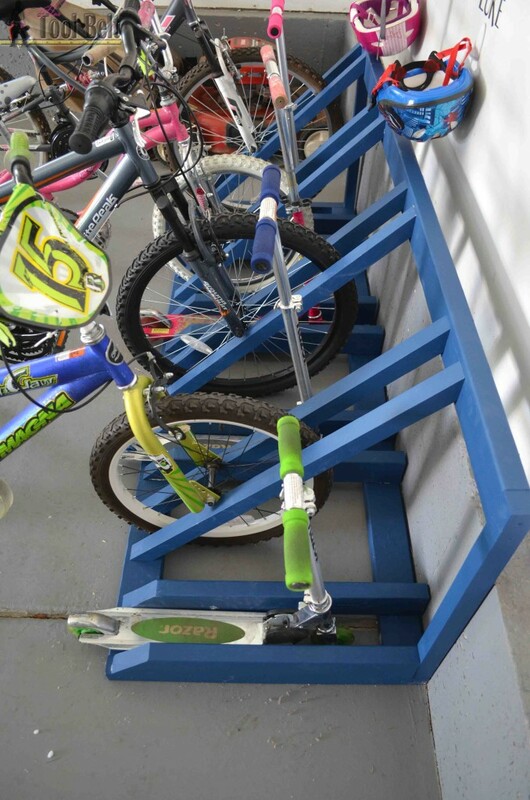 Check out some of the other clever organization projects. Super-awesome idea! That is the perfect way to corral the bikes and especially the scooters… Love the color! Great build Amy! (I just need a garage first ;)) But I love how easy it is for the kids to roll in and not have to fumble with the kick stands. And very pretty paint color too! What a great idea! Bikes and scooters take up so much room and your rack keeps them perfectly contained. Arrrrg! Why didn’t I know you and have DIY skills when my kids were little! Seeing this picture brought back so many memories of tripping over bikes and those Razor scooters too! This is brilliant and a good way to teach the kids to put things back in place too. Smart project! Awesome tute Amy! 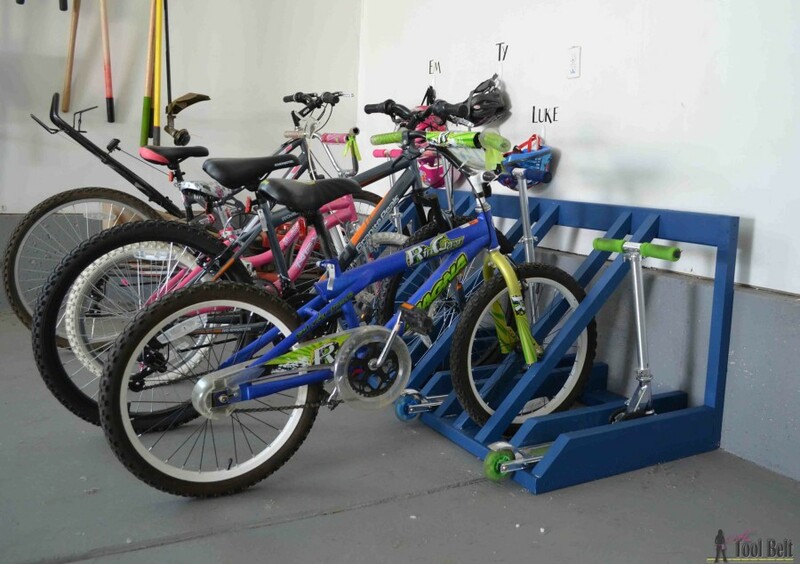 Busy families definitely need a way to keep all those “wheels” organized! I love the cougar blue color. Oh my gosh could we have used one of these in our shed when my kids were little! Your sister and her kids, must’ve been tickled pink when they saw their Christmas gift. Nice project Amy! My husband and I own several bikes and bike trailers. This sure would come in handy at our house! Pinned! This is seriously on my build list for 2016 – our garage NEEDS it! Geez, I too wish I had this plan when my kids were growing up! With 7-yes SEVEN, you can just imagine the “parking” issues! I did, however, have a solution to leaving their bikes out on the front lawn that worked wonderfully. I would wait until the “offender” was well snuggled and asleep in their warm bed for at least an hour then rouse them up, pulling their feet to the floor, urgently telling them, “you have to go get your bike ( or scooter), its going to be stolen! I will go with you but I can’t ride it to put it away, hurry! Before someone takes it! I never raised my voice but very supportively and sympathically pushed, pulled, led them outside in the cool/cold night in only their jammies -no time for a coat or to get dressed-😲😲😟😟😟😟😟😟😟😟😟to bring in their bike, very sympathetic and lovingly urgent all the way. 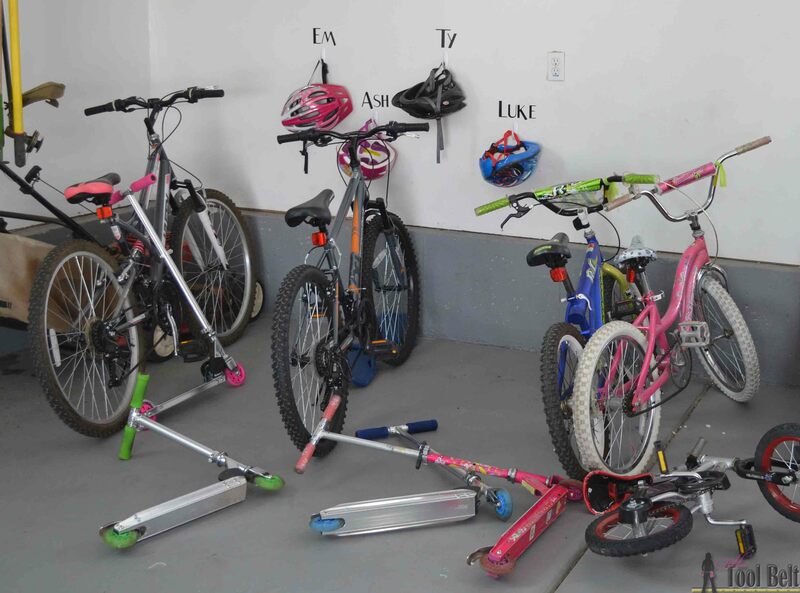 It usually only took one time to get woken in the middle of the night and thereafter all I had to say was,”.are your bikes put away?” Some of the youngers even learned from the olders experience! tsk. With 6 kids you know I could use this! Thanks, Amy! This is awesome! Thanks for sharing the plans! Awesome tutorial and a wonderful solution for getting the garage organized! Pinning this one! Great tutorial and plan. I am always tripping over scooters, so this would be wonderful. Pinning so I can make it. had to change dimensions and design to prevent scooters and smaller bikes from falling over. Thank you for this. Just made one and can’t tell you how easy and happy I am with the outcome. The wife and kids are super happy. Would love to post a pic of it to show others. Amy, great plans. Just wanted to let you know of a correction in your Material List. 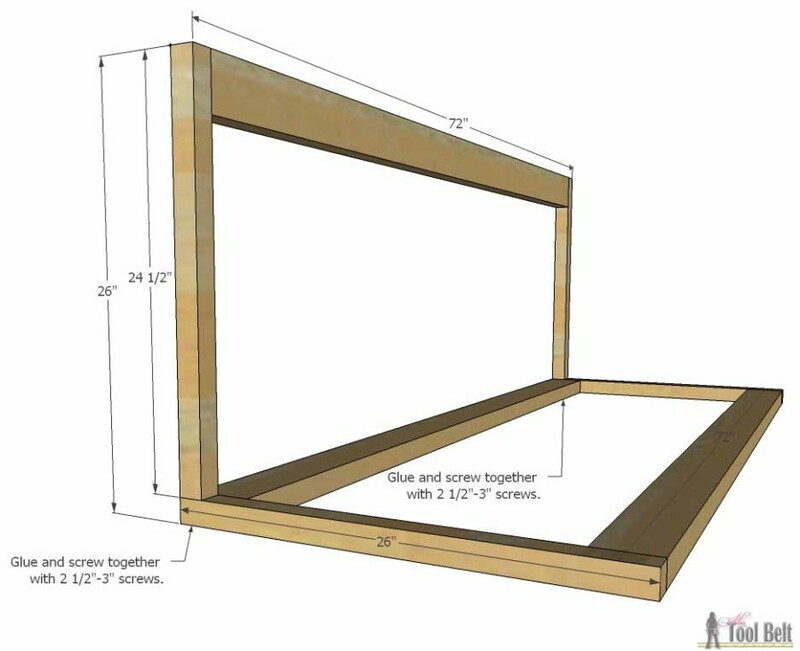 I think you meant 2×2’s instead of 2x4s for the angled boards that hold the bike wheels. Thanks so much for catching that.